Titan Poker (www.TitanPoker.com) opened for business in 2005 as a member of the quickly growing iPoker Network. Although Titan Poker does not accept players from the United States, it has managed to become one of the largest online poker sites in the world. Newly redesigned poker software, easy to beat competition, and a 100% up to $500 bonus welcome all new players at Titan Poker. Titan Poker doesn't accept USA players, but the site is one of the premier online poker rooms for non-Americans. Titan offers smooth software, massive player traffic, and easy to beat competition. Plus, if you sign up at the Titan poker room with bonus code BPSORG, you will automatically receive a 100% up to $500 bonus on your first deposit at the poker room. Read our full Titan Poker review for details. Large tournaments and a big selection of cash games are among Titan Poker’s strengths. The software supports multiple languages and poker currencies so players from all around the world can play at Titan. Thanks to these strengths and a recent software upgrade, it’s difficult to come up with any negative remarks about Titan Poker. Titan Poker offers new players a 100% deposit bonus for up to $500 if they sign up with bonus code BPSORG. This bonus is awarded to all first time depositors who sign up with the bonus code listed here. In other words, Titan Poker doubles the first deposit of every new player up to a maximum of $500. The bonus code is entered when signing up for a new account at Titan Poker. On the new account application, there is a box that asks for your “bonus code.” If you type in the code BPSORG when asked for it, you will receive this bonus when you make your first deposit. Learn more by reading our full Titan Poker bonus guide. The Titan Poker bonus is cleared by earning Titan Points in real money games. Every 600 points releases $5.00 of the bonus, and these increments continue until the entire bonus has been released. Players have three months to release their bonus money - after three months, any remaining bonus money expires. Players earn Titan Points by playing real money cash games, sit and go's, or tournaments. At the cash tables, players can earn between 0.3 Titan Points and 24 Titan Points per hand depending on how much rake is taken from the pot. In sit and go's and tournaments, players earn 17 Titan Points for every dollar they spend on tournament fees. For example, if you enter a $20+$2 tournament, you would earn 34 Titan Points. Check out this article from our How To Blog to learn more about earning Titan Points at TitanPoker.com. A few of the most notable features include four color decks, player notes, a buddy list system, real time hand histories, and a mini-table view for multi tablers. 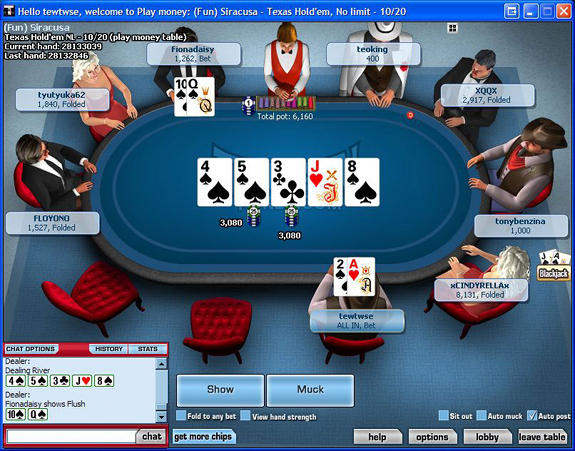 Players may also resize the tables at will and arrange them on screen in any manner. These features all make for a flexible, customizable poker experience. The tournament lineup at Titan Poker is large one that includes tournaments of all types. Every Sunday Titan Poker hosts a $250,000 guaranteed prize pool tournament and every month they host a $1,000,000 guarantee. Players may also participate in a $100,000 guaranteed tournament every Friday. Satellite tournaments have become especially popular at Titan Poker. These tournaments give players the chance to win seats and travel accommodations to major live tournaments around the world. Players can win seats to events such as the World Series of Poker and the Irish Open at a fraction of the buy-in cost. In addition to multi table tournaments, Titan also offers a wide variety of sit and go's at all levels. The new jackpot sit and go's offer players massive payouts if they win several sit and go's in a row. The Fort Knox $50,000 jackpot SNG, for example, pays players $50,000 plus a progressive jackpot if they win 6 sit and go's in a row. Traffic has picked up considerably at Titan Poker since it opened in 2005, especially during European peak hours. It’s not uncommon at all to find more than 50,000 players logged in. Even during the day, Titan Poker displays impressive traffic stats. At the time of this writing, there are just under 24,000 players online at Titan. The difficulty of competition varies wildly at Titan Poker. For the most part, the games are easy but you’ll still run into the occasional tough player. The player base has grown so large in recent years that you’ll find players of all skill levels at the tables. Your best bet is to practice a little table selection and look for tables that have the highest percentages of players to the flop. Titan Poker accepts deposits in Euros, Pounds, US Dollars, Canadian Dollars, and South African Rands. The list of deposit options at Titan Poker includes: credit card (Visa or MasterCard), Moneybookers, Neteller, ClickandBuy, Click2Pay, Instadebit, Ukash, bank transfer, iDEAL, Ticket Premium, Przelewy24, POLi, EcoCard, WebMoney, myCitadel, UseMyBank, Moneta, Dankort, Entropay, Sofortüberweisung, Giropay, Nordea, Enets, Boleto, Abaqoos, eKonto, EPS, Euteller, Ewire, Neosurf, Multibanco and Teleingreso. Players may cash out via check, bank transfer and any of the above e-wallets. Withdrawals are processed in a timely manner and customer support is always available for assistance in either depositing or cashing out. Another one of Titan Poker’s greatest strengths over the years has been its top notch customer support team. Players may contact support 24/7 via phone, e-mail, fax and live chat. The support reps won Online Gambling Magazine’s award for the best customer support in 2006, 2007 and 2008. Ready to Play? Visit Titan Poker to Get Started Now! Now that you know everything about TitanPoker.com, it's time to get started. Sign up at Titan Poker with bonus code BPSORG to automatically receive our exclusive 100% up to $500 sign up bonus.